There’s nothing more frustrating and sometimes alarming than to have car trouble and to be stuck in an unfamiliar place unable to help yourself. If it hasn’t happened to you already be rest assured that there is a good chance it will. Imagine you are on your way home from the California Symphony. It’s dark and it’s raining. All of the sudden you drive over something in the road. Your tire blows. You safely steer to the side of the road. You’re stuck. You’re helpless. You don’t know how to change a tire and guess what? You don’t even have a spare! It’s time to call the professionals. It’s time to call Shield Towing. Shield Towing and a network of independent tow truck operators provide professional towing & roadside assistance services in the Walnut Creek area. We can come to your rescue with one of our qualified wreckers. You are going to need to be towed. Your smart choice is calling us because we are the licensed professionals in wrecker services. Don’t let an incident like this get you down. Call us and let us get the job done right. We are are a reliable tow truck company. Why Shield Towing in Walnut Creek? Shield Towing is the first tow truck company you should think of because we offer many conveniences and we do it with a smile. We’re always happy to serve you and provide you with excellent customer care. Contact us for help at any time. We are available 24 hours a day, 7 days a week to provide you with our wrecker services and more. We will be there timely of your call. We are diligent and responsive to your needs. You’ll be blown over by our prices. There will be no doubt in your mind that you are paying the fairest price for our services. 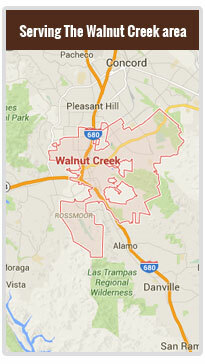 We have been proudly serving the Walnut Creek community for years.